“How many times can I say ‘Do-Gooder’ in the same conversation, ya think?” Genevieve Nalls jokes. In this context, she can say it as many times as she damn well pleases. Nalls is doing some serious good with her company, The Podge Co. And she’s doing it by working with some pretty special people and brands. “I knew that I always wanted to work with Do-Gooders,” she shares. “Do-Gooders are people who use their skills or talents to make themselves, their businesses, and the world a better place,” she adds. But, seriously, what’s that mean? Responsible, aware people and businesses driven by strong missions that either use their product or service for a good cause, help the environment’s sustainability, inspire people to be the best version of themselves or bring joy and whimsy into the world. Or perhaps people and businesses who do all of the above. Are there Do-Gooders who don’t know they’re Do-Gooders? How she partners with these Do-Gooders is just as unique as the personalities themselves. The Podge Co., which launched just last week, is a Design + Educational Collective with a 4-Phase Plan. Nalls is currently driving Phase 01, focusing talent and energy in two, distinct ways that strengthen each other beautifully when paired together: she not only creates branding, but also designs both one-on-one and larger group workshops that teach strategic, brand subjects such as Brand Discovery or Core Values – topics that allow people and businesses to better understand their brand and add more meaning to their respective lives and work. That intimate conversation between design and psychology is something that Nalls has been mulling over since college. A graduate of Virginia Tech, Nalls earned a degree in Architecture and minored in Psychology both which informed her unique perspective on the connection that exists between creative design and the human mind. 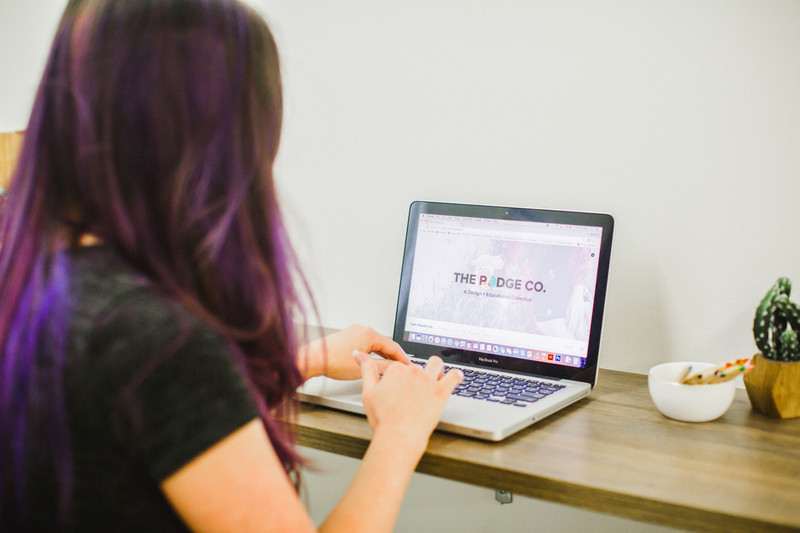 Today, the culmination of that vision and talent is The Podge Co. – a business and an opportunity to drive that connection forward faster for people and brands earnestly committed to making a difference. One of her go-to lessons that both big brands and personal brands can relate to? The identification of core values. So, what’s the first step in that process? 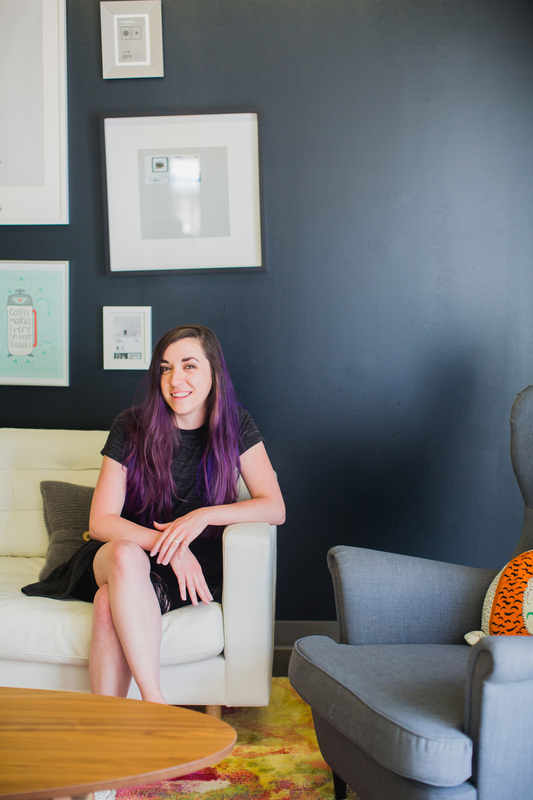 A Charlotte resident for five years, Nalls met Hygge Founder, Garrett Tichy, at a WeLoveCLT Speaker Series event several years ago; they stayed in touch which is how she learned about the co-working space. She joined Hygge West a little over a month ago. 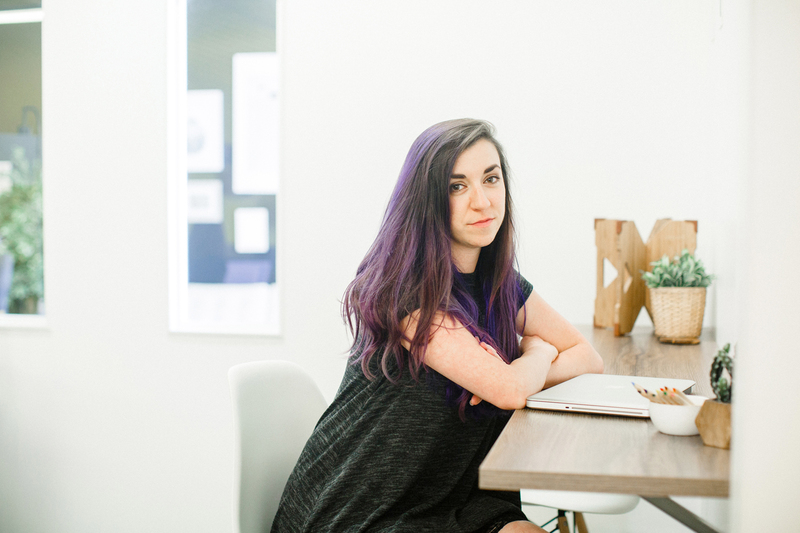 We absolutely count Nalls among the cool with her sweet demeanor, whimsical sense of style, and purple hair. So, how’s it feel to live out that core value with purple hair? Confidence aligned with core values? Exactly the good we need more of in this world.